NASA has revealed fresh research on the Chelyabinsk meteorite that exploded over Russia in February, and the findings aren't good: not only does it look like the astronomic models about the number of similar-sized things reaching Earth are wrong, but also the damage they can do is much greater than expected. "If you look at the number of impacts detected by US government sensors over the past few decades you find the impact rate of kiloton-class objects is greater than would be indicated by the telescopic surveys," said Bill Cooke, meteoroid environment office lead at NASA’s Marshall Space Flight Center at a press conference on Wednesday. "Over the past few decades we've seen an impact rate about seven times greater than the current state of the telescopic surveys would indicate." Cooke said that as the current state of asteroid surveys was expanded he expected we would find more meteorites in the vicinity to account for these impacts, but also that the amount of damage they caused was being reassessed. The nuclear model used to estimate the amount of explosive force such incidents could cause had, in fact, been over estimating the blast impacts of such air-bursting meteors, he explained. But the amount of heat they generate, and the damage caused by the shockwave of air they push before them as they come down through the atmosphere, was significantly underestimated. 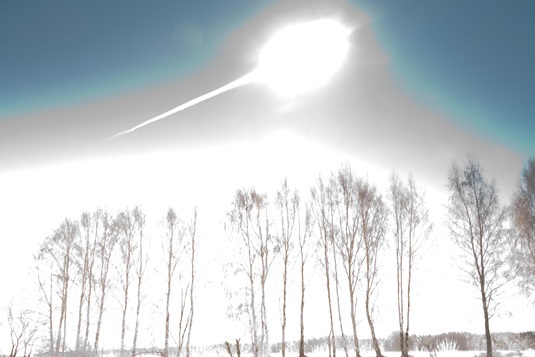 The Chelyabinsk meteor is the largest foreign body to come down to Earth since the Tunguska event in 1908, where a comet or meteor devastated 2,150 square kilometers of Siberia with an airburst, according to Lindley Johnson, NEO program executive of NASA's planetary science division. Thanks to the amount of dashcam videos, smartphones with cameras, the work of "citizen scientists," and boffins around the world sharing their data, NASA has now piece together exactly what happened during the Chelyabinsk event he explained. The meteorite arrived completely unexpectedly because it was coming at Earth with the Sun behind it, masking its progress NASA said. It hit our atmosphere at a speed of 42,500 mph (19 kilometers per second) and the vast majority of its mass was destroyed in the detonation 23 kilometers above Russia. Around 9,000 to 13,000lb (4,000 to 6,000 kilograms) of the meteor survived the blast and fell to Earth, including several chunks that have been recovered. From an analysis of the remains scientists have concluded that fractures in the meteorite (formed from an impact with another space rock) left veins of silicates running throughout its body, making it much more likely to break up in the friction with our atmosphere. The brightness of the object, and the amount of energy it transferred, surprised scientists. The meteor was briefly brighter than the Sun, even 100 kilometers from the site of the incursion, and the shockwave it created flattened buildings, shattered glass and injured 1,200 people. Analysis of its remains show the Chelyabinsk meteorite was formed about 4.4 billion years ago and was 19 meters across. Objects under thirty meters wide aren’t expected to have the mass to make an impact with the Earth's surface without disintegrating under the stress of atmospheric contact, according to NASA's models. Larger objects, such as the 40 meter asteroid 2012 DA14, which skimmed past Earth on the same day as the Chelyabinsk meteorite, could make it to the surface and cause considerable damage, Johnson said. But NASA did have viable plans to divert such dangers if they are spotted soon enough. One idea is to launch a spacecraft directly at the incoming object. Provided it had sufficient mass, and could accurately hit the incoming rock, then the impact would slow the asteroid down to the point where Earth would have passed by the time it crossed our orbital plane. If NASA had more of a warning it could send another mission to the asteroid which would use a "gravity tracker," harnessing the attractive force of the spacecraft and the rock to subtly divert its course away, but said that this would take a number of years to achieve. What was needed he said was a dedicated infrared telescope in orbit to complete a more thorough survey of near-Earth objects. Searching on the IR band would make these objects stand out more he told El Reg, and give a better estimate to their size.